A table at the end of Aircraft Programmes, above the Aircraft Projects section, provides the in-service years and numbers received or on order of JASDF aircraft types in chronological order. Under the current MTDP, the Japan Ministry of Defense declared its intention to acquire three new tanker/transport aircraft of then unspecified type for the JASDF. The first and second aircraft were included in the FY2017 and FY2018 budgets, none were added in FY2019. At a press conference on October 23, 2015, Defence Minister Gen Nakatani announced that the U.S. government-proposed Boeing KC-46A had been selected; one appeared on the finalized fiscal 2016 budget shopping list, but approval only came with that requested under fiscal 2017 funding. Setting a deadline of September 8, a request for proposals had been issued on June 17, 2015. Airbus having declined to make “inappropriate use of shareholders’ funds and company resources” by putting forward its A330 Multi-Role Tanker Transport for what they clearly saw as a lost cause, the Boeing KC-46A was the only submission. At the time of the announcement of the type’s first overseas sales success, the U.S. Air Force KC-46A Pegasus programme was nearing the end of its development phase. Based on the Boeing 767-2C, the first of four prototypes had flown for the first time only a month before, on September 25. To be based at Miho AB in Tottori Prefecture, Japan’s KC-46A fleet will be capable of refuelling the JGSDF’s MV-22 Osprey tilt rotor aircraft. Their unit price tags of 20.8 billion yen (around $173 million) due to be funded as part of the fiscal 2016 budget, the aircraft are planned to be deployed in around 2020. The exact dates will be subject to slot availability on a production line that is currently set to fulfill a U.S. Air Force requirement for 179 aircraft over the space of a decade commencing in August 2017. Operated from Chitose AB outside Sapporo, Hokkaido Prefecture, the two Boeing 747-400s used to transport the prime minister and members of the imperial family are scheduled to be withdrawn from service by the end of March 2019. It was announced early in August 2014 that they would be replaced by two B777-300ERs. Taken at San Bernardino, California, a photo of the first aircraft, which was originally due for delivery in autumn 2018, appeared in a Japanese daily newspaper in mid-October 2016. The second aircraft was then set to arrive at the end of 2018, in time to commence full, two-aircraft operations when the 747s are withdrawn. Following a competitive bidding process, the ground support contract is to be switched from Japan Airlines to All Nippon Airways. On April 28, 2015, the Cabinet Secretariat issued a press release that included information on the new colour scheme selected for the two aircraft (above). Selected from several put forward by Boeing, the basic colour scheme retains the Japanese flag-derived, red-and-white upper surfaces of the B747s and repeats the application of grey to the wings and horizontal tail surfaces. In place of the current staid fuselage cheat-line, the major change is the flowing fuselage stripe. According to the Japan Ministry of Defense, this radical design departure represents the realization of dynamic (economic) growth without fear of change and expresses in design form Japan’s sense of active engagement (in global affairs) in the years to come. Although the possibility of detail changes remains, another illustration and a three-view drawing are available for viewing in pdf format at the Cabinet Secretariat’s Japanese-language website here [link]. As things turned out, the first aircraft arrived at Chitose from Switzerland on August 17, 2018 (see Bulletin Board report); the second aircraft followed suit on December 11. In July 2016, the Air Staff Office issued a request for information from companies interested in supplying and maintaining three of a new type of flight check aircraft and related equipment as a replacement for the YS-11FC and the U-125 tragically lost in an accident in the previous April. Planned for delivery by the end of March 2021 via Kanematsu Corporation, which acquired the Japanese sales agency rights from Cessna parent Textron Aviation in 2015, the Citation 680A beat off rival bids submitted in October by Sojitz Corporation (Bombardier Challenger 650) and Mitsui Bussan Aerospace (Dassault Falcon 2000S). An initial two of the type received funding under the FY2017 budget; none featured in the FY2018 budget. Aside from the Citation’s assessed advantages in terms of performance and price, a major factor acting in Kanematsu’s favour was the company’s 20-year track record of supplying special mission aircraft to the JASDF and its delivery of three Citation CJ4 flight inspection aircraft to the Civil Aviation Bureau, also in 2015. The December 2018 issue of Kōkū Fan magazine contained a photo of the first aircraft, registered N137A and carrying the number ‘031’ on its nose. The ministry’s then Technical Research & Development Institute (TRDI) at Gifu has been using a ground test airframe to verify the C-2’s structural integrity since 2005. On January 7, 2014, that airframe sustained damage to its cargo door and rear fuselage during pressurization tests, prompting the temporary grounding of the two XC-2s until February 19. As reported in the Koku Fan magazine published in July (the September issue), an investigation found the root cause to have been a stress concentration-induced rupture at the part of the fuselage frame close to where the cargo and ramp doors meet. In the meantime, the two XC-2s continued to be operated from Gifu AB, having surpassed a combined total of 300 test flights. The first prototype appeared in formation with the 44-year-old prototype C-1 (now designated C-1FTB) during the SDF review flypast at Hyakuri AB, Ibaraki Prefecture, on October 26, 2014. From November 2014, the first prototype’s fuselage was replaced by one built to production aircraft standard; the aircraft was returned to the test programme at Gifu on February 24, 2016. This was the second time the C-2 programme had suffered a major delay. KHI engineers were forced back to their drawing boards in 2007 after structural weaknesses were found in the main wing of that same first prototype XC-2, which was rolled out on July 4, 2007, but did not complete its maiden flight until January 26, 2010. The aircraft was finally handed over to the TRDI for flight testing two months later, on March 30. The second prototype had made its first flight on January 27, 2011, and immediately joined the flight test programme. During the course of 2013, the aircraft was engaged in the in-flight, low-level operational testing of the ramp door and used to conduct paratrooper drop tests from its side door. These were followed by snow-covered runway trials from Gifu in December 2014 and deployment to Miho for three days of ground handling trials in October 2015. Modified for the electronic intelligence (ELINT) and surveillance role, which has been fulfilled by a modified 1977-vintage Kawasaki C-1 flying as the EC-1 since 1983, the second prototype commenced flight testing from Gifu on February 8, 2018 (link). The first production C-2 took to the skies for the first time on May 17, 2016, and was officially handed over to the Ministry on June 30, the first of three scheduled for delivery by the end of March 2017. The JASDF still has an estimated requirement for 30 of the aircraft, which is in the same weight category as the Airbus A400M and Antonov An-70. As shown in the chart below, orders for 11 production aircraft have so far been placed; the single aircraft requested under FY2016 funding failed to secure final approval. Drawn up before the pressurization test setback, the MTDP included 10 aircraft. It was January 2018 when the first of the production examples were declared fully operational with an active unit at Miho in Tottori Prefecture, where in September 2013 a new control tower was inaugurated and new purpose-built hangars were being built in anticipation of the C-2’s arrival. The completion of the first new hangar was marked by a ceremony on January 27, 2017. The delivery of the 10th aircraft built is expected by the end of March 2019, making a total of eight in squadron service. Although a trickle of JGSDF CH-47JA deliveries is being maintained, JASDF CH-47J orders are in abeyance. The most recent of the 31 examples produced for service with Air Rescue Wing units was ordered under fiscal 2010 budget funding and entered service in 2013. Of those 31 helicopters, the last half (since 2002) were all to long-range (LR) specification standard. According to media reports in the summer of 2014, a total of 88 F-15Js are to undergo modernization, a programme that had been given added impetus following the U.S. decision to ban the export of the Lockheed Martin F-22 Raptor in July 2007. The pace of the modernization programme over recent years is shown in the chart below. Appointed JASDF chief of staff in August 2013, General Harukazu Saitoh was asked about the F-15J modernization programme during an April 2014 interview that appeared in the August edition of JWings magazine. Having commanded the 305th Tactical Fighter Squadron during the mid-1990s, he readily admitted that the aircraft has undergone considerable change. Replacing the radar and avionics, upgrading the missile armament (to the Mitsubishi Electric AAM-4B) and improving situational awareness by the installation of an advanced data link, which also negates the need for pilot’s to relay information to other aircraft over the radio, have made the F-15J a far more capable aircraft. The June 2016 issue of JWings reported that a total of 102 F-15J/DJs were planned to undergo modernization and that 80% of the F-15Js and around half of the F-15DJs had already been through the process. While much has been made of the “pivot” toward Asia in overall U.S. foreign policy, there is per force also a distinct shift toward the southwest within the Japanese defense organization. A January 2016 organizational change involved the F-15Js of the Tsuiki-based 304th Tactical Fighter Squadron saying sayonara to the F-2s of 6th TFS to join the 204th at Naha AB on Okinawa, where the 83rd Air Wing was re-designated the 9th Air Wing. In the case of the F-2, funding was sought and approved for air-to-air combat capability improvements to be made to 40 F-2s and the supply of 70 sets of related equipment between fiscals 2010 and 2014. Improvements were made to nine aircraft and 12 sets provided under fiscal 2016 funding, followed by 16 aircraft upgrades and the supply of an additional nine sets in fiscal 2017; under fiscal 2018 funding two aircraft will undergo improvement work and five sets provided. Running in parallel with this programme between fiscals 2011 and 2013 was adding Joint Direct Attack Munition (JDAM)-carrying capability to 43 aircraft. In previous years, budgeting had covered the supply of JDAM weapon conversion kits. 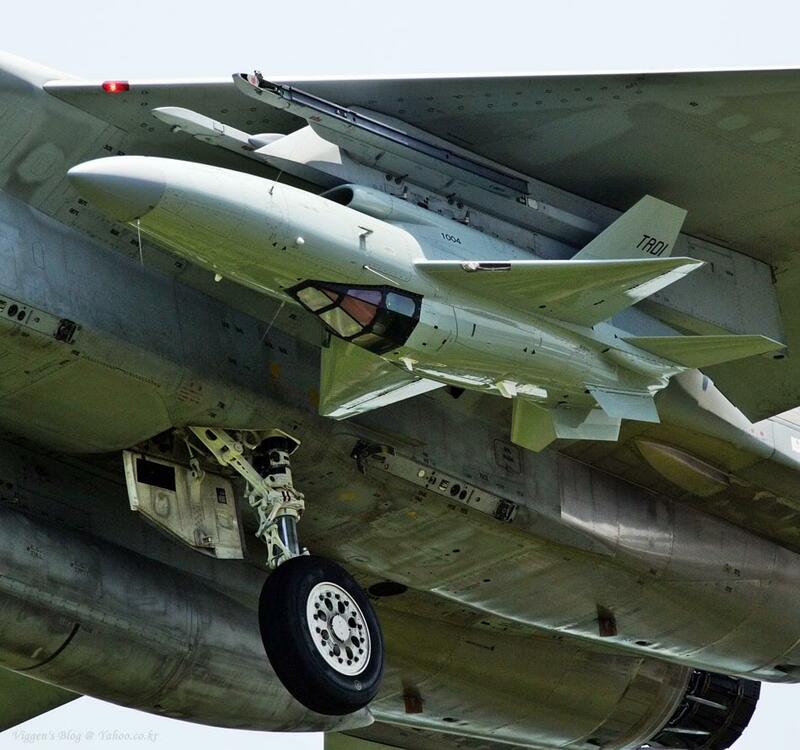 Funding for the trial mounting of a single targeting pod was approved in the fiscal 2014 budget. The fiscal 2018 budget successfully included requests to fund the upgrade of two F-2s to make them compatible with the Jieitai (SDF) Digital Communications System (JDCS) for fighter aircraft; this followed those in 2015 (2), 2016 (4) and 2017 (12). On the subject of the F-2, repair funds were made available for 13 of the 18 F-2Bs damaged at Matsushima by the tsunami that struck on March 11, 2011. As the type is no longer in production, replacement parts such as flaps were manufactured at Lockheed Martin’s Dallas-Fort Worth facility. Initially, there were plans to repair six aircraft, all of which were delivered back to the JASDF by March 2016. Adding a further seven for a total of 13 aircraft, to be returned to service by the end of March 2018, reduced the cost per aircraft to around 7.3 billion yen (currently around $60 million). Having been transported by road to Mitsubishi’s Komaki plant in Nagoya, repair work on the selected aircraft did not commence until July 2012. The first repaired F-2B was test flown from Komaki on February 16, 2015, and officially handed over at a ceremony held at the same location on April 21. The handover ceremony was attended by around 120 people, including military personnel and representatives from Fuji Heavy Industries, Ltd., Kawasaki Heavy Industries, Ltd. as well as Lockheed Martin Corporation. The same day, the aircraft was taken by an 8th Sqn pilot on an hour-long ferry flight to its temporary home at Misawa, where some 600 4th Air Wing personnel were waiting. Repairs to the hangars and apron at Matsushima were completed by the end of March 2016. Following the first flight of the 12th aircraft following repairs in mid-January 2018, the programme was on course for on-time completion. A short (no sound) video of the events on April 21 can be viewed via the JASDF Official Channel on YouTube here [link]. The Japan Ministry of Defense announced the selection of the Lockheed Martin F-35A Lightning II—the conventional takeoff and landing variant [link]—to fulfill its F-X (F-4EJ replacement) requirement on December 11, 2011. An agreement to purchase up to 42 aircraft followed in June 2012. The roll-out ceremony for the first JASDF F-35A took place on September 23, 2016. As shown in the table below, the approval of the six aircraft requested under fiscal 2016 brought the total number of F-35As on order to 22 and accounted for 16 of the 28 planned over the duration of the MTDP. An additional six aircraft have been requested and approved under each of the two subsquent budgets. The first JASDF F-35A (AX-1) was rolled out at prime contractor Lockheed Martin’s Dallas-Fort Worth plant on September 23, 2016. At that time, the first four aircraft were scheduled to be delivered, presumably to the AD&TW at Gifu AB, from March 2017 onwards (and by the end of 2017). The subsequent 38 examples are being produced in Nagoya by Mitsubishi Heavy Industries (MHI). Lockheed Martin concluded the final assembly and check out (FACO) facility details with MHI and the other parties involved early in 2014. Following its selection by the U.S. Department of Defense, Nagoya will ultimately serve as the North Asia-Pacific regional Maintenance, Repair, Overhaul and Upgrade (MROU) facility, part of a global network providing advanced, long-term support for the F-35 fleets of a number of services. On the engine front, the Pratt & Whitney division of United Technologies Corporation signed an agreement with IHI Corporation covering the F135 turbofan in November 2013. On October 2, 2015, a ceremony was held at Northrop Grumman Corporation’s Palmdale Aircraft Integration Center to mark the completion of the centre fuselage for the first of those 38 indigenously produced aircraft (AX-5). Giving some idea of the production rate, the milestone involved the 207th example of the major structure and the 30th unit manufactured in the year. The manufacturing process at the Nagoya Plant includes mating the centre fuselage to the Lockheed Martin-produced forward fuselage/cockpit and wings as well as to the aft fuselage and empennage produced by principal subcontractor BAE Systems plc; AX-5 commenced its journey through the process on December 5, 2015, and was rolled out on June 5, 2017. Due to be introduced into service in 2017, the May 2016 issue of Koku Fan had carried photos of the still ‘green’ aircraft as it briefly saw the Nagoya light of day. Although not a development partner, Japan invested in the FACO facility at Nagoya in part to maintain its expertise in the high-tech aerospace industry. While work progresses on the first aircraft, vertical logistics systems are being incorporated to compensate for the reduced floor space available. In the latter half of 2014, the F-35 programme had made headlines as a result of the current Japanese government’s decision to conditionally lift the country’s long-standing, self-imposed ban on arms exports from April 1, 2014. On the one hand, the move appeared advantageous for the likes of Mitsubishi Electric Corporation and IHI, who could now plan to export their respective radar and engine components for installation in the F-35s operated by other nations’ air forces. On the other hand, the move prompted the Ministry of Defense to look into recouping part of its budgeted initial investment expenses, should an item of defence equipment be exported and contribute to the company in question’s profits. Having requested increased government funding to enable the company to supply F-35 rear fuselages to BAE Systems, traditional JASDF jet fighter supplier MHI was unable to reach an agreement—on either the amount of profit that could be expected or the amount that would be reimbursed—and postponed its participation in the programme, pending contract renegotiation. As reported in the November 7, 2014, edition of the Tokyo Shimbun, this put on hold MHI’s export of assemblies, which are nonetheless components, but the company had already received orders to assemble and conduct the final checks on its quota of 38 aircraft for the JASDF at the dedicated facility, newly rebuilt with taxpayers’ money, inside its Komaki South plant. While concerns were raised in the summer of 2014 about the impact of the U.S. dollar exchange rate on the F-35 programme as a whole, the aircraft kept an otherwise aptly low profile on the Japanese media radar screens. A full-scale F-35A mock-up was present at Hyakuri AB, Ibaraki Prefecture, for the SDF review in October of that year (and at the Japan Aerospace 2016 industry exhibition held in Tokyo). The engine fire that befell an aircraft on the ground at Eglin AFB, Florida, in June 2014 might be used in evidence by the local population as the type’s arrival at its first operational base of Misawa, Aomori Prefecture, looms near. In 2000, staunch local government opposition on safety grounds was a factor in the delayed arrival of the first JASDF F-2s at the base. The November 2017 issue of Kōkū Fan, which appeared in mid-September, reported that a Provisional F-35A Squadrom would be forming at the end of fiscal 2017 and work up to strength with 20 aircraft to enable the 302nd Squadron to re-form on the type at Misawa by the end of fiscal 2018. The 301st Squadron is currently scheduled to soldier on with the Phantom until fiscal 2020, when it too will switch to the F-35A and take the place of the ultimately Hyakuri-bound 3rd Squadron’s F-2s at Misawa. Meanwhile, the F-35 has already become a familiar sight in western Japan following the arrival of a U.S. Marine Corps unit at Iwakuni, Yamaguchi Prefecture. Aircraft basing remains high on the political agenda in Okinawa, where Governor Takeshi Onaga made the vexed subject of the U.S. military presence the focus of his campaign in winning election in November 2014. Ahead of the vote, the Okinawa Times for November 10 that year reported that a plan was being devised to also maintain U.S. Marine Corps F-35s at Kadena AFB on Okinawa. Wisely, neither the U.S. nor the Japanese government has revealed any details about operating the F-35 from Okinawa, but the newspaper was highlighting a move that does at least assume integrated U.S. and possibly JASDF operations there. According to plans announced by the Marine Corps at that time, the ramp at Kadena was to be upgraded to accommodate F-35 operations in fiscal 2016. The 10th JASDF F-35A, and the last of the four FY2014 aircraft, flew for the first time on September 13, 2018, and was followed by the 11th aircraft (89-8711) on November 1, 2018. The 12th aircraft completed its first flight on February 5, 2019. 2016, when the JASDF aircraft became the first Foreign Military Sales F-35 to arrive at the base. The low-visibility hinomaru markings applied for the roll-out had been removed by this time. aircraft was rolled out at the company’s Final Assembly and Check Out (FACO) facility on June 5, 2017. Not to be confused with the current JGSDF utility helicopter requirement, the JASDF’s own UH-X programme for fiscal 2011 revolved around a next-generation rescue helicopter. Ultimately, three UH-60Js were requested and approved under fiscal 2011 funding. The pattern of acquisition in recent years, which included a failed request in fiscal 2013, is shown in the chart below. A contract for the equivalent of around U.S.$43 million was placed with Mitsubishi on February 29, 2016, to cover the single aircraft included under FY2015 budget financing; delivery was scheduled for January 2018. The Japan Ministry of Defense announced on December 18, 2015, that additional UH-60Js would be procured under the fiscal 2015 supplementary budget as part of additional funding earmarked to provide enhanced cover for disaster relief. ; as it was, eight were procured under the fiscal 2016 budget. The 55th JASDF UH-60J flew for the first time in October 2017 and, after a delay, was delivered on January 26, 2018. At the same time, the JASDF is hoping to be able to increase the number of UH-60Js retrofiited with in-flight refueling probes. The contest was between two types: the Northrop Grumman E-2D Advanced Hawkeye (link, note that the right-hand sidebar listing includes a cutaway, courtesy Flight International), which would offer some degree of commonality with the E-2C already operated by the JASDF; and the Boeing 737 AEW&C Wedgetail (link), as operated by the Royal Australian Air Force. It was announced on November 21, 2014, that the E-2D had been selected to form the fourth constituent element of the JASDF’s AEW Group. Valued at $151.3m, the contract for the first E-2D was awarded in November 2015, with completion due originally by March 2018. Second and third examples were successfully sought under the fiscal 2016 (contract placed August 2016) and 2018 budgets. In July 2016, three months after having received request for proposal-prompted bids, the Ministry of Defense announced that Kawasaki and IHI would be the companies contracted for the maintenance of the E-2D airframes and engines, respectively. In August 2016, the first two aircraft were being manufactured at Northrop Grumman’s St. Augustine facility in Florida for delivery in 2018. Unlike their shipborne U.S. Navy counterparts, JASDF E-2Ds carry extra fuel in their wings, thereby increasing their endurance by around three hours to eight hours. The first aircraft [link] flew for the first time from there on October 9, 2017, and underwent mission systems flight testing from the company’s facility in Melbourne, Florida, from December 2017. (See also Bulletin Board entry for Nov. 13, 2017.) Funding for a fourth aircraft was included in the finalized FY2019 budget. In a related move announced in the FY2019 budget, the planned enhancement of the Airborne Warning and Control Group will be reflected in its re-designation as the Airborne Warning and Control Wing. 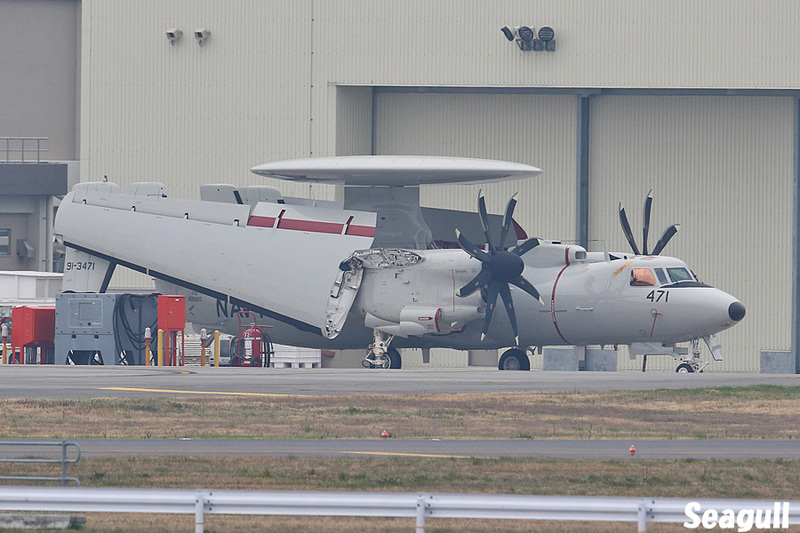 The first of two E-2Ds (91-3471) due this fiscal year finally arrived at Iwakuni (link) on March 15, 2019, before being flown to Misawa on March 27. Still wearing U.S. national markings and the word ‘NAVY’ on its fuselage, these were to be removed and hinomaru applied prior to the official handover ceremony and the commencement of operational evaluation flights from Hamamatsu. The third and fourth aircraft are due to arrive in fiscal 2020 and be stationed at Naha. A U.S. Air Force RQ-4 Global Hawk lands at Misawa AB, Aomori Prefecture, on May 24, 2014. On temporary detachment, the pair of aircraft were the first of the type to touch down in Japan. In a sign of things to come for the JASDF, the U.S. Air Force deployed two Northrop Grumman RQ-4 Global Hawk unmanned aerial vehicles (UAVs) to Misawa AB, Aomori Prefecture, from May to October 2014. Moved to escape the typhoon season at their normal base on Guam, the aircraft were shown off to local dignitaries and the Japanese media on May 30, and one was placed on static display at the base air show in September. On November 20, 2014, the Japan Ministry of Defense announced that the Global Hawk had been selected over the General Atomics Guardian ER. The budget request had given no indication of the amount of funding and merely stated that the type of UAV was being selected. The MTDP includes provision for three UAVs for “joint units,” in other words to be jointly operated with the U.S. Air Force. Although there were reports that the first could be in service as early as this year (2015), fiscal 2015 funding only covered expenditure for components of a system that will take some time to implement. Although the forecast was that the three aircraft would be acquired during the course of fiscal 2019 and be operational in fiscal 2020 at the earliest, the first aircraft was approved under the fiscal 2017 request, a fiscal 2016 request for all three was denied, only for single aircraft to be included in the FY2018 and FY2019 budgets. Used to assess the damage to the Fukushima nuclear power plant complex in the aftermath of the March 2011 tsunami, the Global Hawk will obviously offer a significant improvement in the JASDF’s intelligence, surveillance and reconnaissance (ISR) capabilities around disputed islands. It can be expected that the JASDF version would also be equipped with sensors to enable the detection of ballistic missile launches. For such a technologically advanced nation, Japan appears a comparative laggard in terms of the development of an indigenous unmanned aerial vehicle (UAV) reconnaissance system. Although Japanese industry began producing target drones in the 1970s and developed helicopter-based systems for the JGSDF from the 1990s, this accumulated expertise has not been utilized toward, for example, the full-scale development of a sophisticated medium-altitude, long-endurance (MALE) system. In 1995, however, a team from prime contractor Fuji Heavy Industries (FHI) commenced TRDI-authorized project development work on TACOM, from tayoto kogata mujinki (multirole, small UAV). Essentially a feasibility study for an infrared sensor-equipped, air-launched system, the programme focused on such areas as an autonomous target tracking system. The design included a parachute and flotation bags to enable the vehicle to be retrieved from the sea at the end of a mission. In the summer of 1998, the prototype F-4EJ Phantom, which was then assigned to the Gifu-based Air Development & Test Wing (AD&TW), was photographed with a TACOM mounted on each of its inboard underwing weapons stations. The aircraft acted as “mother” ship on a total of 22 missions. Having achieved the first of five fully autonomous flights on May 7, 1999, the flight test programme of this initial design was concluded in 2001. As shown in the photo above, the third of the six TACOMs built was displayed on a trolley at the Yokohama Pacifico Exhibition Centre during Japan Aerospace 2004. A nearby signboard gave its dimensions (length 4.7 metres, span 2.5 metres) and weight (620kg [at launch]). Note the dorsal air intake for the Teledyne Model 382-10J turbofan and the foldable wingtips, which were extended in flight and enabled the vehicle to fit between the F-4EJ’s centreline and wing-mounted drop tanks. Funded between fiscal 2004 and fiscal 2011 as the Unmanned Aerial Research System (UARS), the “Improved TACOM” design featured the addition of an undercarriage. Target acquisition and tracking is by means of an infrared sensor mounted in a multifaceted, glazed ventral housing. A sign at a briefing given by the TRDI in 2007 gave the length and height of this definitive version as 5.2 metres and 1.6 metres, respectively, as a well as a weight of approximately 700kg. Although a prototype was reportedly lost at sea after launch from an F-2 in 2010, it is believed that two vehicles remain. A concept diagram and thumbnail images still appear under Test Records if you scroll down on this page of the TRDI website [link], and the UARS still occasionally appears in the Japanese aviation media. Taken in October 2013 and published in the January 2014 issue of Koku Fan, one photo shows a red-and-white example mounted on an AD&TW F-15J (again the first aircraft delivered to Japan). The vehicle appeared to be equipped with cameras and bore seven mission markings on the side of its fuselage. A fine study of another vehicle, painted in low-visibility grey, appears here [link]. The March 2016 issue of JWings magazine carries a photo of an AD&TW F-15J carrying TACOM 1001 aloft in December 2015. One of two TACOMs on display at the Gifu open house in October 2015—both been adorned with the unit’s 60th anniversary tail markings and temporary shark’s mouth insignia—1001 had in the interim had two more test flight score markings added for a total of seven. Now designated the X-2, the then Advanced Technology Demonstrator (ATD-X) was unveiled on May 8, 2014. In July 2014, the TRDI website featured photographs of its then engineless experimental Advanced Technology Demonstrator (ATD-X) being towed out of a paint shop at the Mitsubishi Heavy Industries (MHI) Komaki South Plant in Nagoya on May 8 [link]. Taken from above, one photo revealed the relatively small size of the aircraft; although taken into the sun, the other showed the aircraft almost in profile and the line of the wing merging point above the side-mounted air intake. Timed to coincide with the appearance of the photos on the TRDI site, a behind-the-scenes report on the aircraft was featured in a 30-minute segment aired on Tokyo-based TBS TV’s Japan News Network programme on July 12. Screen grabs soon started to appear on social media [link] and the entire programme was even uploaded to YouTube [link]. The definitive X-2 was presented to members of the media in its Komaki South hangar on January 28, 2016, as recorded on another YouTube video [link]. The video also includes footage of one of the radio-controlled models (see below). Roughly the size of a Saab JAS39 Gripen and sporting the standard red and white colour scheme favoured for military aircraft prototypes, the aircraft represents the latest phase in a feasibility study programme that was launched in 2007 but dates back to 2000. Originally, what is now the X-2 was given the enigmatic codename Shinshin, the two-kanji combination that has the general meaning of mind or spirit, but this appellation is no longer used. In addition to the undertaking of research into flight control systems that would enable highly manoeuvrable flight, a more sinister-looking, full-scale radar cross section (RCS) model was tested at a French government facility in the latter half of 2005 and displayed at the Japan Aerospace Exhibition in 2008 after the conclusion of that stage of development. The X-2’s low RCS-optimized fuselage cross section, described in the Japanese aviation press as like that of an abacus bead, arose from that research. [Above and below] A full-scale model of what was to culminate in the X-2 underwent radar cross-section testing at the French Direction Générale de l’Armement facility near Rennes. These photos appeared in the defence white papers for 2007 and 2008, respectively. The RCS model was followed by flyable, one-fifth scale models, one of which was revealed in 2006 [link]. From that year, five years of parallel research were conducted into the so-called smart skin, whereby the external fuselage structure is embedded with self-diagnostic microsensors. Manufacture of the ATD-X, now X-2, and a ground test airframe commenced in 2009. Also appearing in the Defense of Japan 2008 white paper, this photo shows technicians preparing one of the radio-controlled scale models that were used for high angle of attack testing. As its initial name implied, the ATD-X was destined to be used as a test bed for research and systems integration. The aircraft is intended to act as a stepping stone on the way toward the possible production of a scaled-up, next-generation fighter, incorporating what have been dubbed i3 (informed, intelligent, instantaneous) technologies and counter-stealth features. Released by the TRDI, the early examples of digital mockup (DMU) concept designs from 2011 and 2012 resembled the F-22 Raptor and Northrop/McDonnell-Douglas YF-23, respectively. Dubbed 25DMU (from the Japanese calendar year Heisei 25, or 2013), the latest known example incorporates some of the design features of its predecessors. 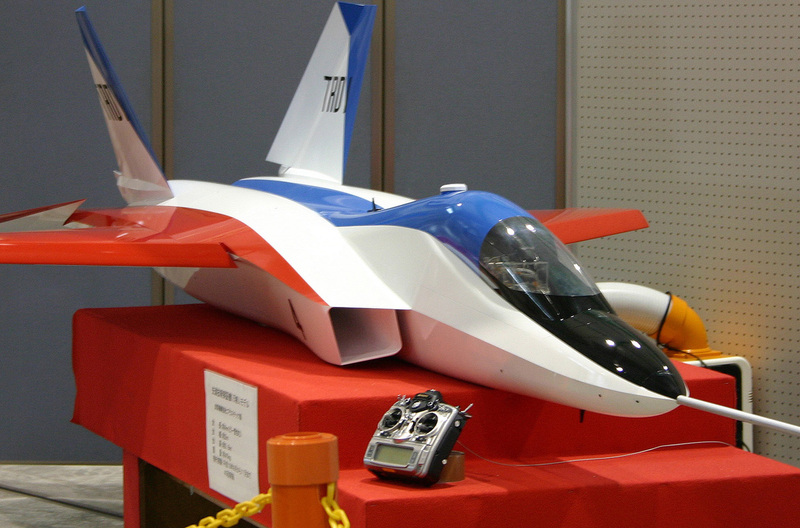 Following the RCS model, a combination of a model displayed at a TRDI event in 2007 and a 1/10th scale wind-tunnel model displayed at Gifu AB open day in October 2012 (photo below) had already provided heavy hints with regard to the direction the then ATD-X’s configuration was taking, but closer inspection of the photos from May 2014 revealed more details of the definitive version. Salient points included the four-sided horizontal tail surfaces, which had been five-sided in the full-size mockup, and the rounder air intakes. As tends to be the case in the Japanese aircraft industry, the aircraft represents a joint effort, with one prime contractor (MHI) mating major assemblies from other companies; the wings and both the horizontal and vertical tail surfaces were supplied by Fuji Heavy Industries. Building on earlier research that was also conducted in the 2000s, the X-2 will be used to investigate axisymmetric engine nozzle thrust vectoring. This will be achieved by three “paddles” mounted around each tail pipe, as seen below in a close-up view of the wind tunnel model. Such devices have previously appeared on the ill-fated Rockwell-MBB X-31 and NASA’s F/A-18-based High-Alpha Research Vehicle. All things considered, the X-2 marks an important step in Japan’s efforts to retain and build on the expertise accumulated in the production of its own fighters. Also worthy of note in those May 2014 photos was the cost-saving use of a canopy from a Kawasaki T-4 (prompting design changes from the T-2 canopy on the full-size mockup) and the undercarriage from a Mitsubishi T-2, although each of the mainwheels sports the T-4’s cluster of three landing lights. For some reason, the area of the standard hinged T-2 noseheel door was masked in some views in 2014; masked areas also appeared on the fuselage sides aft of the cockpit, presumably obscuring intakes. Not content with working on its first indigenous fighter since the end of World War II, the development of the X-2’s two 11,000lb-thrust IHI XF5-1 turbofan engines, first installed on the aircraft in July 2014, also breaks new ground through the utilization of ceramic composite turbine blades. The XF5-1 has its origins in basic research carried out from 1991. The first of four test engines was delivered to the TRDI in 1998, but a full five-year prototype programme was not scheduled to start until 2015. Reflecting the X-2’s role as a lower-powered, scaled-down test bed, the next-generation fighter, if proceeded with, is planned to be powered by a pair of a small-diameter 33,000lb engines of a type that has been under development since 2010. On January 7, 2015, The Asahi Shimbun website reported that the first flight of the X-2 stealth demonstrator, which had been planned for that month or at the latest by the end of the fiscal year (March 31), had been postponed to April or later. The reason given was that the device that senses the throttle position was not working normally, and fixing the defect would require some corrections to the software. The report quotes the Japan Ministry of Defense as also saying that it had been decided to add a system that automatically restarts the engine in the event of an in-flight flameout, as installed on the latest U.S. fighters. The aircraft’s first taxying trial took place at Nagoya on February 11, 2016, as recorded in edited form in this YouTube video (link). After being transported by road to Gifu, the X-2’s first flight took place on April 22; a joint TRDI/JASDF test flight programme was then scheduled to run until around spring 2017. In a November 2017 interview with Flight International, manager of the Future Fighter Program at the Acquisition, Technology & Logistics Agency (ATLA, formerly the TRDI) Hirofumi Doi said that the X-2 had flown 34 of the originally planned 50 flights; only the first two of which had been conducted by Mitsubishi. The project would be concluded in March 2018, but what was to become of what is essentially a data-gathering aircraft thereafter had yet to be decided. The results of this, the most significant of no less than 15 programmes looking into specific stealth technologies, would allow assessment of the merits and demerits of Japan going its own way with future fighter acquisition or simply adding to its 42-aircraft order for F-35As. Under the MTDP, the Ministry of Defense also planned to acquire three new tanker/transport aircraft of unspecified type (see Boeing KC-46A above). In a related move, 1.4 billion yen was earmarked to add the tanker function to C-130H Hercules transports, but fiscal 2015 only included 600 million yen for one set of components; another tanker upgrade set was unsuccessfully requested under fiscal 2016 funding. A programme is also under way to increase the number of UH-60J SAR helicopters equipped with refueling probes. A fine study of a Kawasaki T-4 from the 13th Flying Training Wing at Ashiya, Fukuoka Prefecture. Later on, the emphasis will switch to include aircraft types that were built under licence, including the service’s quartet of mainstay fighters: the North American F-86F Sabre; Lockheed F-104J Starfighter; McDonnell-Douglas F-4EJ Phantom; and McDonnell-Douglas F-15J Eagle.